been supplied to rebels in Yemen and fired at an airport in Saudi Arabia. Iran denied her accusations. 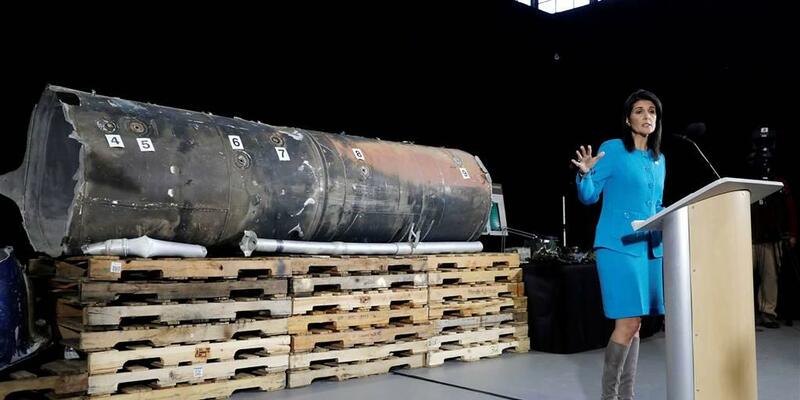 “Iran has never provided [Houthi rebels in] Yemen with missiles and these allegations are completely groundless,” Iran’s UN ambassador to the UN Gholamali Khoshroo said. He accused Haley of falsifying her evidence and said it reflected the US’ irresponsible, destructive and provocative policy in the region and towards Iran. “The goal of such allegations is to cover up Saudi Arabia’s crimes in Yemen,” Khoshroo continued, according to the news agency IRNA. Iranian Foreign Minister Javad Zarif tweeted a picture of Haley next to a picture of former US Secretary of State Colin Powell in 2003 presenting what he said was evidence of Iraq’s weapons programme – intelligence which later turned out to be false but kicked off the Iraq war. “When I was based at the UN, I saw this show and what it begat,” Zarif tweeted alongside the photos. But Saudi Arabia welcomed Haley’s comments, and reiterated its condemnation of Iran for supporting the Houthi rebels, who are fighting against the Saudi-led coalition in the Yemen conflict. Haley said the UN Secretary General Antonio Guterres’ latest implementation report on the Iran nuclear deal, which was released publicly on Thursday, gave clear evidence that Iran was violating Security Council resolutions. Asked if the Security Council is likely to take action against Iran, Britain’s UN Ambassador Matthew Rycroft said that it is important to demonstrate – “to everyone, including to sceptics” of the nuclear deal – that council members are willing to follow up on reports of Iranian misbehaviour.